Since being pregnant, I’ve realised just how important R&R is. Before I would probably ignore my body, go to the gym anyway and then start the whole cycle again but these days if I want a nap, I have one and if I’m too tired to go to the gym, I’ll stay in bed for an extra hour. It doesn’t happen much but for me I’m aware I’m growing a tiny little person and her needs comes before mine. I love R&R these days. It’s the time when I really feel my baby kick and move about. I feel incredibly connected to her when I feel her and wish I could feel it all the time. It’s such a special feeling. So when I came across these Mexican Bola necklace from Blooming Lovely Jewellery, I had to get one! 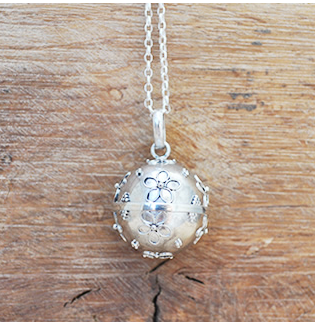 The chiming pendant is traditionally worn by pregnant women to bond with their unborn babies. The lovely ball design, falls low over my growing bump and gently chimes as I move. Why does it chime? Well it’s said to gently serenade and soothe baby as I go about my daily life. I’ve found it very comforting to wear, especially as some days I don’t get to sit down – it’s all rush, rush, rush, and I just want to sit down and feel her kick. It’s nice to know that she knows mummy is there and thinking of her even when I’m rushed off my feet. This really is a lovely gift to wear throughout your whole pregnancy, everytime I hear the chime, it reminds me that I have a very special baby inside of me and that I do have to take things a little bit easier these days. Since getting it I have hardly taken it off! Frankie from the Saturdays hasn’t either!